As mentioned in his character introduction, Rafael has a bit of crazy in him, and it reflects in the moves that he uses. He has moves that feel very random, while others seem bizarre to those who are unfamiliar with his abilities. Rafael has 2 Technical type skills, 1 Defensive, and 1 Hindrance skill. As Rafael tends to be a wild, his skills take a bit of planning to use effectively. Rafael’s level 1 skill changes the next few blocks to all be the same as the block you had before you triggered the skill. So if you have a piece that looks like it won’t fit well with the opponent’s board, this skill will cause the opponent to receive this piece for the next few blocks. However, this can be a double edged sword since the piece may not play well with you either. Rafael plays a short tune, causing music notes to drop from the sky, clearing a random number of rows on your board. This is a song that will never let your opponent down. 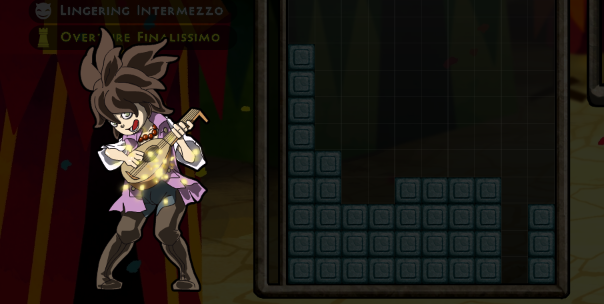 Whenever your opponent clears a line while this skill is active, their pieces above the line will not drop down. This is best used before the opponent plans to clear their lines. So while they’ll still be able to clear lines, their board height will likely remain the same. Rafael’s ultimate song mesmerizes the opponent into performing whatever action Rafael does. If Rafael shifts his piece, the opponent will as well. Similarly for rotating and dropping. This is an extremely powerful skill that can immediately defeat the opponent, but used incorrectly, can do more harm to you than the opponent.